I’ve made a startling discovery. Much in the same way that the position in the night sky of arbitrarily-determined groupings of stars on the day you happened to be born can tell you everything you need to know about your personality, the tonal linguistics of the word for “spoon” in any language is a perfect descriptor of that language’s qualities or character. In layman’s terms, it’s a horoscope for languages. I alone have been endowed with the astonishing ability to read these qualities through the Spoonoscopal arrays of the sonic force. Today I’ll be making a demonstration of these abilities. I shall start by divining for you the personality of the languages with which I am most familiar, to get us accustomed to the power of the Almighty Spoon. I will then use this incredible gift to predict the qualities of languages with which I am not at all familiar, and allow you to judge for yourself. I will now leave the realm of the familiar and apply the laws of Spoonoscopy to three languages with which I have little to no experience. Prepare to be astounded. And that, friends, is the end of my demonstration on Spoonoscopy. I believe the results speak for themselves. Although I may be the first to discover the power of this gift, I have no doubt the Mighty Concave One shines within each and every one of you. 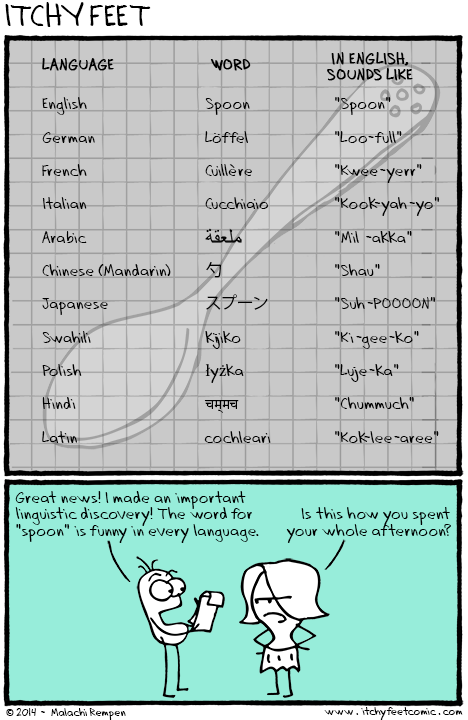 You only need be attentive to its curvy call, and divine for yourself the personalities of languages across the globe. What’s the word for “spoon” in your language, and what can it tell us about its qualities? The Polish one is very off. It would sound more like “Wush-kah”. That “L” that it starts with is not actually an “L” it is an “Ł” and that makes a lot of difference. The “Ż” makes more of a “SH” sound — or better yet, a “ZH” sound. In Irish, it’s “spúnóg.” I imagine it’s originally a loan-word from English. It’s an almost direct cognate. @Lee That looks funny, so I’ll allow it! In Spanish – cuchara. Not to be confused with cucaracha (cockroach)! …as in La cucaracha, La cucaracha, something, something, something something, something, something, something, La cucaracha, La cucaracha…..